Lot 35. Sicily, Syracuse. Ca. 339/8-334 B.C. AE (24 mm, 13.76 g, 4 h). 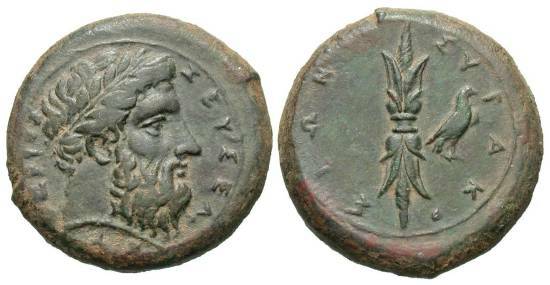 ZEYΣ EΛEYΘEPIOΣ, Laureate head of Zeus Eleutherios right / ΣYPAKOΣION, thunderbolt; in right field, eagle standing right. CNS II, 72; SNG ANS 477-88; HGC 2, 1440. Lovely strike on a nice broad flan. Nice original dark green earthen patina. Extremely fine.